With six sentimental phrases, every click of the pen is sure to bring on a grin and a cherished memory. 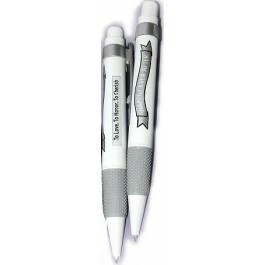 Each well-crafted ink pen has "Happily Ever After" imprinted on one side, along two rotating "window" verses which change every time the writing tip is open or closed. "Today I marry my best friend"
"To Love, To Honor, To Cherish"
"Thank you for sharing this day"
Refillable 5 ½" pens have a comfortable rubber grip and make a lasting impression with a sweet expression!